Learn from a child development expert about the correlation between the age of your child and nighttime dryness. Looking for ways to keep your little one’s bed dry at night? As a child development expert, this is one of the most common topics parents discuss with me. They’re concerned they skipped a step in the potty training journey, or tried to put their little one in underwear too quickly. But actually, the first thing I ask them is what stage they’re at – because nighttime dryness naturally develops over time. Daytime trained and only wetting at night? I always tell parents that nighttime dryness is something that evolves naturally as their child grows. 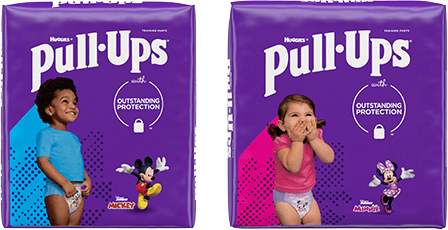 I’m not necessarily their favorite person in the world when I say this, but in most cases nighttime potty training means simply awaiting your child’s physical development. So unfortunately, there’s no handbook I can give you to help speed up the process. But the good news is, you’ve done a great job – and now you can just sit back and enjoy this time with your child. While you’re practicing your patience, you can also practice making good bedtime habits. This means establishing a nighttime routine that includes taking your child to the potty before bed, putting on those Pull-Ups® Night*Time Training Pants, and calling it a night. Whether you like to read a book with your little one or sing a sweet lullaby before bed, just make sure you stop by the bathroom first. Still struggling with nighttime dryness? Children who are fully potty trained by day but still waking up dry three to four times each week, parents may start to wonder about bedwetting. And I always stress to parents that they aren’t alone. Bedwetting is much more common than most people think – it affects 1 in 6 children ages 4 – 12. Parents can help their children by letting them know they aren’t upset or disappointed, and that they’ll help their child find the management solution that works for them. Consider products like GoodNites® that can help ease the stress of bedwetting. GoodNites.com also has tips and advice from experts that can help your child rest easy tonight. And always check with your child’s healthcare provider. Sometimes constipation or other medical issues can cause bedwetting. And no matter what your child’s age is or what their nighttime wetting experience is like, what they need above all else is your love, support and reassurance. It’s okay and although it’s completely normal to feel frustrated that your child isn’t dry at night yet, the sooner you accept that it’s out of your control, the better off everyone will be. I promise someday this nighttime training stuff will be a distant memory!